a whole landscape has lost its quality, its character." 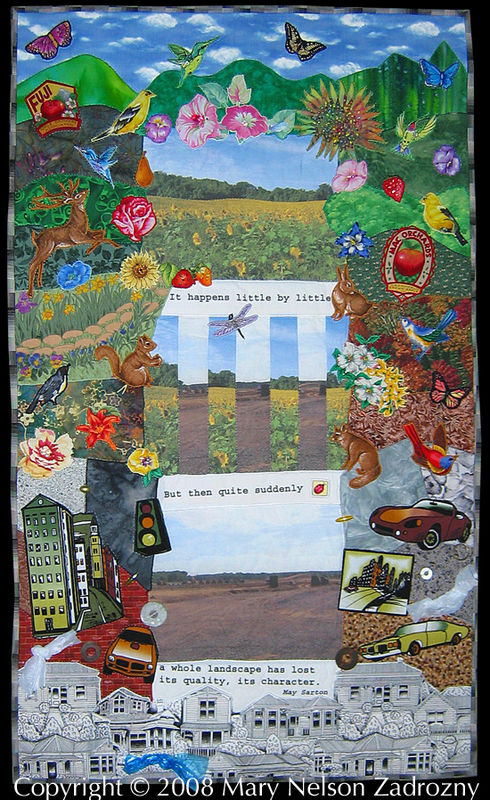 Title: "Going, Going, Gone - Disappearing Central New York Farmland"
Quilt Description: The inspiration for this quilt came from watching beautiful farmland near my home being bulldozed to create new housing developments, golf courses and shopping centers without regard to the long term environmental impact. Land that I have lived near for years, admiring the variety of crops and scenery changing with the seasons, seeing flocks of geese, groups of deer feeding, is now rapidly disappearing. While the overall population in this part of New York state is actually decreasing, the development of land is at an all time high. Every day 174 acres of land is lost to development in NY state. An astonishing 800 farms have been lost in NY since 2006. For more information on the loss of valuable, rich farmland that is occurring throughout the United States, please visit American Farmland Trust. Also there is a great article that explains some of the critical issues "What's Happening to Our Farmland?" This quilt took 58 hours to complete. Materials: Cotton fabrics, Eco-friendly 50% PLA fiber/50% cotton batting from Eco-Craft. Embellished with beads, trash bags, found metal washers and pieces. Techniques: Fusible Applique, Photo Transfer, Hand-Quilted.